Atti’s career has spanned across industries and continents, but it has always adhered to one central tenet: great things can spring from rough conditions if they’re given the right nourishment. Born in Adama, Ethiopia, Atti has traveled the world, developing the educational foundation for the next generation of African leaders. 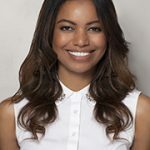 As the founder and CEO of Seeds of Africa, she works to create holistic education and community development centers within urban communities in Africa. Prior to founding Seeds of Africa, Atti won Miss Ethiopia in 2005 and went on to represent her country in the Miss Universe pageant held in Bangkok, Thailand. In addition, she worked as a fashion model in South Africa and the US. What does women’s leadership in Africa look like today? African women are integral to the continent’s growth as members of the workforce (both formal and informal), as entrepreneurs and consumers. However, they don’t get the credit or the income they deserve for their contributions. Further, few leadership positions are made available to women across Africa. According to McKinsey’s Women Matter in 2016, only 5% of CEOs, 22% of cabinet members, and 24% of parliamentarians in Africa are women. These numbers seem shockingly low, and yet align with statistics from US, where only 5% of CEOs and 27% of cabinet members are women. These numbers are embarrassingly low for several reasons. Women get fewer promotions than men – 36% of the promotions go to women – which translates into making the number of women in senior positions very low. Because only 29% of senior managers are women. Of this small minority, only 44% hold “line roles,” or roles which lead to C level positions. Simply put, as we go up in the leadership ladder we find less and less women, and that puts all of us in great disadvantage. Why do we need more women in leadership? The advantages of having more women in leadership are clear. 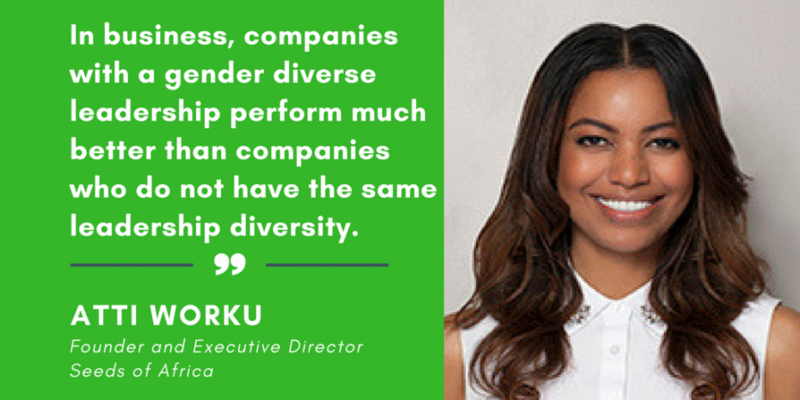 In business, companies with a gender diverse leadership perform much better than companies who do not have the same leadership diversity. As women influence over 80% of global consumption, having more women involved in decision making helps companies relate to consumers better, leading to financial success. In politics, there is growing evidence that when more women are involved, they improve the political process. Women are more interested in working across party lines, they champion issues of gender equality; from working to eliminate gender based violence to fighting for equal pay. They design policies that impact their communities for generations such as making school and the workplace more compatible for girls and women. They become mentors and role models for young women who are starting out their careers or girls who are in school. Having more women in leadership has a significant impact on the bottom line. With all these known advantages, women are coming into leadership at a much lower rate than men. And that is the first change we have to make, we have to increase the rate in which women are coming into leadership roles. To achieve this goal, we have to increase the number of women in the pipeline. We need women to come into leadership roles at a faster rate and higher percentages than they are today. However, that is far from the reality today. Women and girls are not getting equal access to education, healthcare and economic/employment opportunities. According to a report by the United Nations Statistics Division, nearly two thirds of the world’s 781 million illiterate adults are women. And today, girls make up 56% of the out-of-school children population in Sub-Saharan Africa. Additionally, girls continue to be at a significant disadvantage as we go up from primary education (75% of girls) to secondary (38% of girls) and tertiary (6% of women). Poverty, social exclusion, distance from school facilities and poor quality education create even greater disadvantages when coupled with gender disparities. Because girls do not have equal access to education in fields that are traditionally dominated by men such as STEM, the number of women with the right training and skills to get into these fields and get into the pipeline for leadership positions are much lower. There is a lot of work to be done in order to get more women in leadership roles. We have to start at school and continue into the workforce. We have to invest in education, health and economic opportunities for girls and women. Here are a few ways we can reach this goal. Make quality education accessible to girls at all levels, especially for those who are marginalized and disadvantaged. This can be done by increasing educational budgets, abolishing school fees for primary and secondary education, and making cash transfers available to support poor families who cannot afford to send their girls to school. Schools can also be used as resource centers for girls who need additional support to stay and do well in school. Encourage girls to get into fields of STEM (science, technology, engineering and mathematics), finance and politics which are traditionally dominated by men. Hire more women in roles that are dominated by men, provide training and mentorship programs. Also, provide a support system for career advancement. Provide adequate legal protection for girls from harmful cultural practices that become a barrier to go to school or have a career such as early marriage. Create economic empowerment programs that provide training and resources for women who are entrepreneurs, so they have financial independence and leadership opportunities at home and in their own businesses. Undertaking these steps are real, concrete ways to make the world more equal, to enhance growth and prosperity, and to ensure that women are finally fairly compensated for the invaluable contributions they make to society, business and culture. C-level jobs refer to high-ranking executive titles with the “C” standing for Chief.